three panes of glass 窓ガラス 3 枚. コップ，グラス 《★【比較】 glass は通例冷たい飲み物を入れる; cup は温かい飲み物を入れる》. raise one's glass (to…) (…のために)乾杯する. コップ[グラス] 1 杯; コップ[グラス] 1 杯の飲み物[酒] 〔of〕. 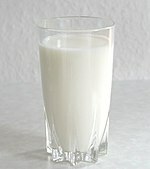 a glass of water [milk] コップ 1 杯の水[ミルク]. The glass is falling [rising]. 晴雨計が下がって[上がって]いる. a pair of glasses 眼鏡 1 つ.
I need glasses when I read a book. 本を読む時には眼鏡がいる. a glass bottle [door] ガラス瓶[ドア]. People [Those] who live in glass houses shouldn't throw stones. 《諺》 ガラスの家に住む者は石を投げてはならない, すねに傷をもつ者は他人の批評などしないほうがよい, 「人を呪わば穴二つ」. glass in a veranda ベランダをガラス張りにする. Glass does not rust or rot. This vase is made of glass. She dropped and broke two glasses. She drank two glasses of wine. I need glasses when I read. A visual effect that imparts a quality of translucency to windows. From Middle English glas, from 古期英語 glæs, from Proto-Germanic *glasą, possibly related root *glōaną (“to shine”) (compare glow), and ultimately from the Proto-Indo-European root *ǵʰel- (“to shine, shimmer, glow”); cognate with West Frisian glês, Low German Glas, Dutch glas, German Glas, Icelandic gler, Swedish glas. (uncountable) An amorphous solid, often transparent substance made by melting sand with a mixture of soda, potash and lime. (countable) A vessel from which one drinks, especially one made of glass, plastic, or similar translucent or semi-translucent material. Fill my glass with milk, please. (metonymically) The quantity of liquid contained in such a vessel. There is half a glass of milk in each pound of chocolate we produce. […] for what lady can abide to love a spruce silken-face courtier, that stands every morning two or three hours learning how to look by his glass, how to speak by his glass, how to sigh by his glass, how to court his mistress by his glass? I would wish him no other plague, but to have a mistress as brittle as glass. (sports) A barrier made of solid, transparent material. He caught the rebound off the glass. (ice hockey) The clear, protective screen surrounding a hockey rink. The glass is falling hour by hour, the glass will fall forever / But if you break the bloody glass you won’t hold up the weather. Were my Wiues Liuer / Infected (as her life) ſhe would not liue / The running of one Glaſſe. (transitive) To fit with glass; to glaze. (transitive) To enclose in glass. (transitive) Clipping of fibreglass.. To fit, cover, fill, or build, with fibreglass-reinforced resin composite (fiberglass). (transitive, Britain, colloquial) To strike (someone), particularly in the face, with a drinking glass with the intent of causing injury. (science fiction) To bombard an area with such intensity (nuclear bomb, fusion bomb, etc) as to melt the landscape into glass. “The Covenant don’t ‘miss’ anything when they glass a planet,” the Master Chief replied. To view through an optical instrument such as binoculars. Andy took his binoculars and glassed the area below. To smooth or polish (leather, etc. ), by rubbing it with a glass burnisher. (archaic, reflexive) To reflect; to mirror.